Cupcakes are so yesterday. I love my Sprinkles, Leda's, and SusieCakes, but 16 post-wedding pounds later, I'm ready to hop (well, with my winter quasi-hibernation padding, more like roll) onto the latest less fattening foodie bandwagon -- "sour" frozen yogurt. This is no ordinary frozen yogurt. Banish from your head any images of pimply-faced teens serving you craptastic TCBY fodder or pints of oh-so-sad fake Ben & Jerry's when what you really crave is real ice cream. No, this is the real deal I'm talking about. It's known as sour frozen yogurt, tart frozen yogurt, Korean frozen yogurt, or Italian frozen yogurt. According to the Los Angeles Times, this is "the taste that launched 1,000 parking tickets." I had to try it myself to see if this magical yogurt lived up to the hype. Result? Yum. But not exactly Mr. Pibb + Red Vines, if you know what I mean. I like it, but I probably wouldn't wait in a serpentine line for it, as I would (and have) for cupcakes. Yes, I am an idiot. Shut up. If you are familiar with Yakult or Calpis, the tang of sour frozen yogurt will come as no surprise to you. The taste is a far cry from highly sweetened American fro-yo. The consistency is somewhat similar, albeit not as creamy (as it is not meant to be a facsimile of soft-serve ice cream), and the tartness is undeniable. 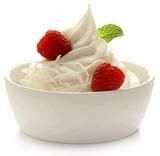 Very little sugar resides in sour frozen yogurt, leaving the acidity to penetrate and linger on your exultant tastebuds. It's not an overpowering sourness. It's a delightful oomph. This is real yogurt. The current reigning champ of sour frozen yogurt in Los Angeles is pinkberry, although some say that pinkberry is actually a rip-off of Red Mango, which has yet to make the same impact here as it has in Korea. And, for the record, Red Mango is allegedly a rip-off of Baby Yogurt in Italy. Who knew there were so many iterations? Looking to challenge pinkberry's prince of pucker status in Los Angeles are ce fiore and Kiwiberri, which has been labeled by some as Fourth Generation Yogurt (i.e., a copy of a copy of a copy of the OG sour frozen yogurt). Foodies seem to be quite disdainful of poor Kiwiberri and have openly bashed it as being a pale imitation of the real thing. I haven't tried Red Mango or the much maligned Kiwiberri yet, but I have had pinkberry and ce fiore, both of which are delectable. 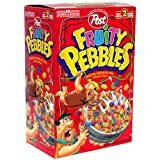 Each store offers a range of toppings for your little mountain of swirled goodness, ranging from fruity friends (strawberries, kiwi, pineapple, bananas, blueberries, raspberries, blackberries) to crunchy companions (almonds, granola, Oreos) to cereal sidekicks (Cap'n Crunch, Fruity Pebbles, Coco Puffs). You can also opt for yummy rice cakes, a.k.a. mochi, dduk, or tteok. It may sound blasphemous, but I think I prefer ce fiore over the vaunted pinkberry. Stop your gasping! To me, ce fiore has a slightly better mouth feel. It is a bit less icy than pinkberry and doesn't melt as quickly. Perhaps I need to do a blindfolded side-by-side taste test like those Coke vs. Pepsi challenges back in the day, but I have had both ce fiore and pinkberry in the last 24 hours (yes, I'm crazy), so I have a good memory of what both taste like. pinkberry only has two flavors (plain and green tea), whereas ce fiore has four (plain, sour, green tea, and blackberry). For those who are not huge fans of the characteristic sour note of this genre of yogurt, ce fiore's "plain" is a good option, as it is slightly less tangy. (ce fiore's "sour" is a slightly more sour approximation of pinkberry's "plain," which is a tad more sour than ce fiore's "plain.") Also, those craving more flavor will likely enjoy ce fiore's blackberry. I got ce fiore's "sour" yesterday with Fruity Pebbles. Yabba-dabba-doo-licious. Today, I had pinkberry's "plain" with rice cakes, strawberries, and kiwi. Mmm. It was great, but it confirmed my suspicion that I am still a bigger fan of ce fiore. Plus, ce fiore has stamp cards, so my tenth yogurt is free. Yay for freebies. My favorite part of joining the yogurt craze is that I can indulge without guilt. This stuff is fat-free and 25 calories an ounce. It's cool and refreshing. It makes you feel clean after eating it, if that makes any sense. However, like boba milk tea, sour frozen yogurt is not for everybody. While some rave about it, others react in the opposite manner. Case in point: some on Chowhound have dubbed it "Stinkberry." Fat Monkey! That Chunky Monkey!